As part of the Foodbuzz Tastemaker Program, I received the opportunity to create a pairing or a recipe that features New Belgium Brewing Company's plethora of brews. Being invited to be one of 150 people in the nation to do this, is exciting and a tiny bit nerve-wracking. I went through dozens of ideas, pairing, recipes, and I decided to stay tried & true to what I know best: Comfort food. 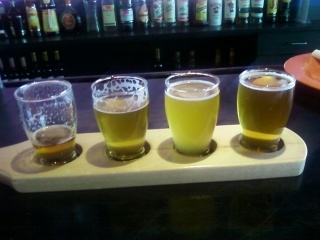 Nothing is more comforting than sampling a flight of beers at your favorite restaurant or brewery. When this photo was taken, I was on my 3rd flight of beers, so I don't remember which beers are in which order, but here we have: Fat Tire, Somersault,Trippel Belgian Style Ale, and Ranger India Pale Ale. 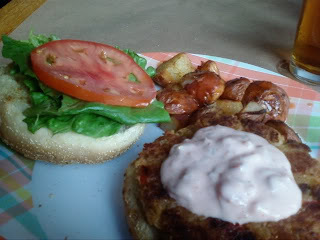 First, I have a crabcake with brunois sweet potato with a creole remoulade. The remoulade puts the sandwich over the top. Lump crab is sweet, succulent, and absorbs flavors very well. Adding spice and a creamy sauce customizes this sandwich and it pairs well with New Belgium's seasonal brew: Somersault. The sweetness of Somersault matches the sweetness of the crabmeat while the citrus notes cut the spice of the added remoulade. Place the 2 tablespoons butter, 2 tablespoons oil, sweet potato, bell pepper, green onion, parsley, Worcestershire sauce, mustard, garlic powder, salt, cayenne pepper in a large saute pan over medium-low heat and cook until the vegetables are soft, about 15 to 20 minutes. Cool to room temperature. In a large bowl, break the lump crabmeat into small pieces and toss with the crackers, mayonnaise, and egg. Add the cooked mixture and mix well. Cover and chill in the refrigerator for 30 minutes. Shape into patties and dust with flour. Heat oil in a large skillet over medium heat. When oil is hot, carefully place crab cakes, in batches, in pan and fry until browned, about 4 to 5 minutes. Carefully flip crab cakes and fry on other side until golden brown, about 4 minutes. Place all ingredients into a food processor and blend until smooth. Chill until ready to serve. 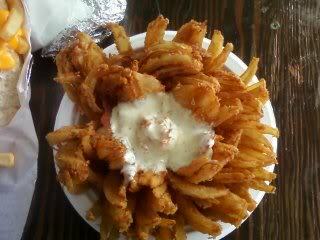 Blooming onions are the bane and the blessing of people all around the nation who visit Outback Steakhouse and food festivals. One of the top fattening foods on the Eat This, Not That list, it pulls in whopping numbers of calories and number of servings for fat, sodium, and everything else bad for you! Ranch dressing is the ketchup of the South and that is what I suggest you serve with this onion. Beer is synonymous with fatty, fried foods and heavy salty snacks. I'd like to think that I did you proud by adding Fat Tire to the batter and trust me (I'm a professional), this pairs well with Fat Tire, too. Fat Tire is New Belgium's flagship beer. While this recipe is not my flagship recipe, it certainly deserves a place in the hall of fame. Mix cornstarch, flour, and seasonings until well blended. Add Fat Tire and mix well. Cut about 3/4" off top of onion and peel. Cut into onion 12 to 16 vertical wedges, but do not cut through bottom root end. Remove about 1" of petals from center of onion. Soak the onion in a bath of ice milk for 20 to 30 minutes so it can "bloom" and reduce the bite of the onion flavor. Dip onion in seasoned flour and remove excess by shaking. Separate petals and dip in batter to coat thoroughly. Gently place in fryer (or large stock pot) and deep−fry at 375 degrees F for 3 minutes. Use a slotted spoon to submerge onion in oil) Turn over, and fry an additional 3 minutes. Drain on paper towels.